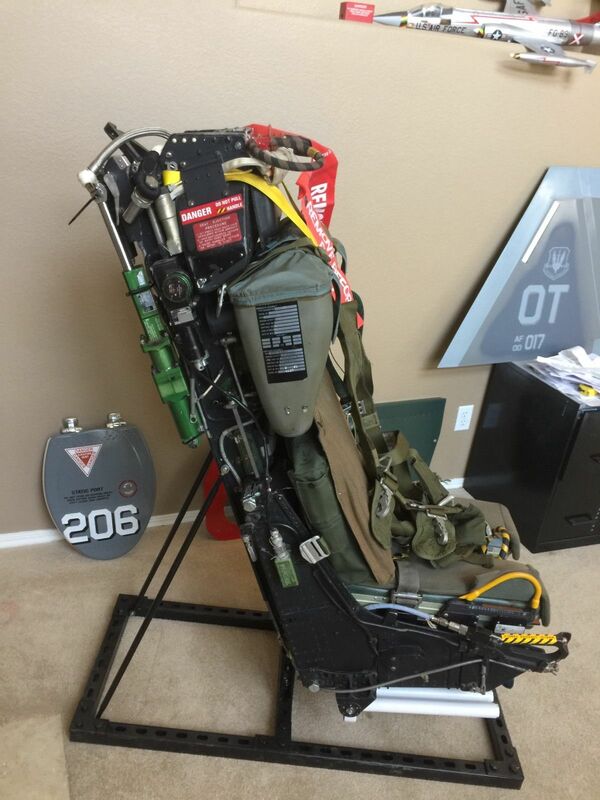 As far as I know, this is the world’s first home made Ejection Seat Office Chair, made out of a F-104 Starfighter. I built a stand for it as well as made replica Rocket Motors for the bottom (white tubes). Some of the parts are technically incorrect for this particular seat, like the F-4 Phantom hard parachute container as well as the seat back pad. The Survival seat may be incorrect as well, but with any restoration, it takes time to find the correct parts. The paint is original and there are a few small dents and typical wear associated with a seat of this vintage (guessing 1964?). As I add the proper components, the price will go up, or you can buy it now, most of the visitors to your home or office will have no idea if the parts are correct, but it looks complete now. Local pick up in Las Vegas or I can crate it up for about $100 and you can arrange a shipping company to ship it to you, the weight without a crate is about 200 pounds, figure another 60 pounds for a crate. Yellow circles indicate the dented areas.